THE VIEW FROM MY SHOP MMS MAY 2018 42 mmsonline.com A Metalworking Leader's Perspective Getting It Right the First Time Attack your manufacturing process with a plan. 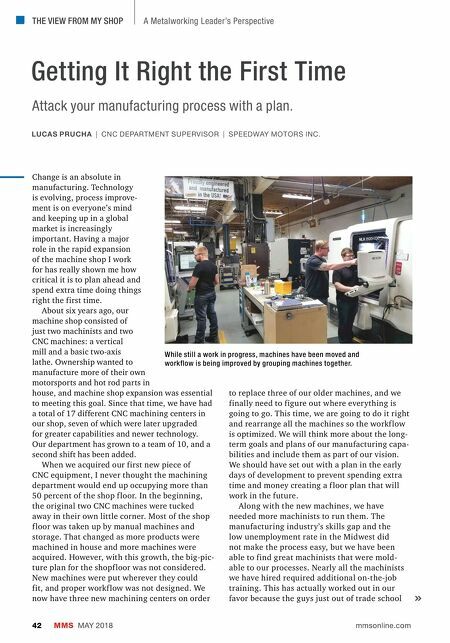 LUCAS PRUCHA | CNC DEPARTMENT SUPERVISOR | SPEEDWAY MOTORS INC. Change is an absolute in manufacturing. Technology is evolving, process improve- ment is on everyone's mind and keeping up in a global market is increasingly important. Having a major role in the rapid expansion of the machine shop I work for has really shown me how critical it is to plan ahead and spend extra time doing things right the first time. About six years ago, our machine shop consisted of just two machinists and two CNC machines: a vertical mill and a basic two-axis lathe. Ownership wanted to manufacture more of their own motorsports and hot rod parts in house, and machine shop expansion was essential to meeting this goal. Since that time, we have had a total of 17 different CNC machining centers in our shop, seven of which were later upgraded for greater capabilities and newer technology. Our department has grown to a team of 10, and a second shift has been added. When we acquired our first new piece of CNC equipment, I never thought the machining department would end up occupying more than 50 percent of the shop f loor. In the beginning, the original two CNC machines were tucked away in their own little corner. Most of the shop f loor was taken up by manual machines and storage. That changed as more products were machined in house and more machines were acquired. However, with this growth, the big-pic- ture plan for the shopf loor was not considered. New machines were put wherever they could fit, and proper workf low was not designed. We now have three new machining centers on order to replace three of our older machines, and we finally need to figure out where everything is going to go. 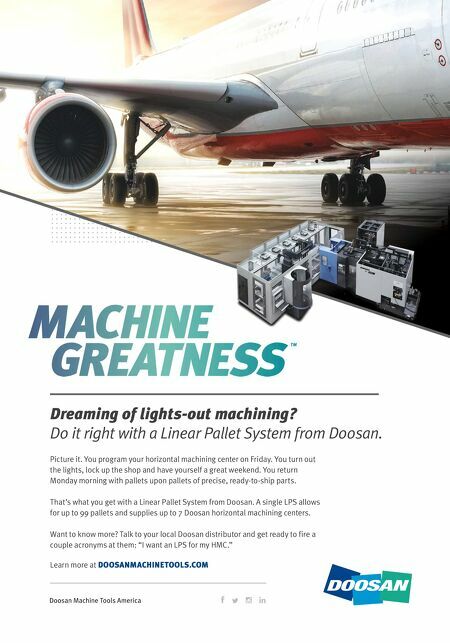 This time, we are going to do it right and rearrange all the machines so the workf low is optimized. We will think more about the long- term goals and plans of our manufacturing capa- bilities and include them as part of our vision. We should have set out with a plan in the early days of development to prevent spending extra time and money creating a f loor plan that will work in the future. Along with the new machines, we have needed more machinists to run them. The manufacturing industr y's skills gap and the low unemployment rate in the Midwest did not make the process easy, but we have been able to find great machinists that were mold- able to our processes. Nearly all the machinists we have hired required additional on-the-job training. This has actually worked out in our favor because the guys just out of trade school While still a work in progress, machines have been moved and workflow is being improved by grouping machines together.